It seems that Kubuntu after user login, starts using latest keyboard layout the user used it in the previous session. So when I shut down my computer with Arabic layout, it logins again with Arabic and vice versa for English. However, still there is no any option to overcome this situation. i.e an option to stick the starting layout after login to a specific layout regarding less what was used in the previous session. Browse other questions tagged 18.04 keyboard kubuntu keyboard-layout or ask your own question. How can I switch to a keyboard layout? 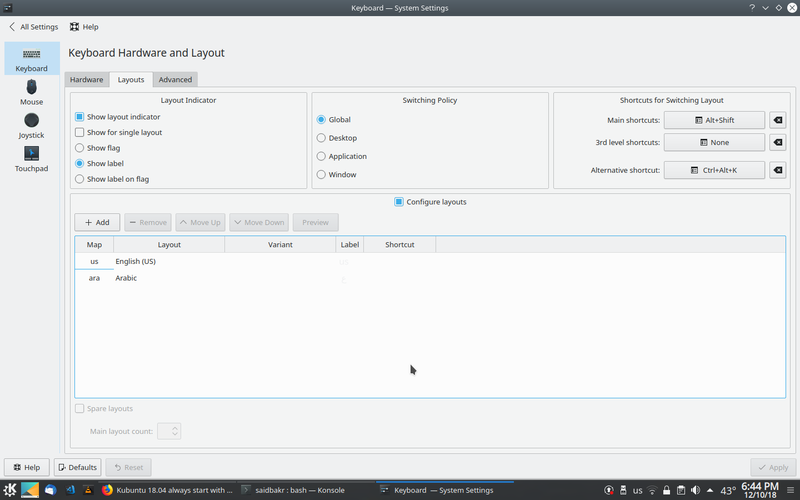 How do I select the keyboard layout when I log into my Kubuntu 14.04 machine?